The Zoom features in Storyline make it easy to get a big-picture or close-up view of your course content while you're building or editing your course. This tutorial shows several ways to change the zoom. Tip: Because of the way text is rendered when you're editing your slides, if you work at a zoom percentage other than 100%, it's possible that the text spacing or wrapping might end up looking slightly different when you publish. If you find that happening, change your zoom back to 100%, adjust your slide content to look the way you want, and then republish. Ctrl-mousewheel: This is probably the easiest and quickest way to zoom in and out. Hold down your Ctrl key and scroll your mousewheel. Scroll forward to zoom in, or backward to zoom out. Zoom slider: In the lower-right corner of your screen, you'll see a zoom slider. Drag to the right to zoom in, or to the left to zoom out. Zoom percentage: Next to the zoom slider in the lower-right corner of your screen, you'll see a zoom percentage. 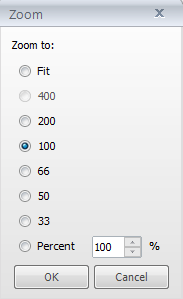 You can click the percentage to bring up the zoom window, where you can change the zoom to whatever you like. You can also access this window by clicking the View tab and choosing the Zoom button. Fit to window: To the right of the zoom slider in the lower-right corner of your screen, you'll see a small rectangular button with arrows. Click that to make everything fit in the viewable area of your Storyline window. Or, click the View tab and select Fit to Window.